Thousands of dead bats are dropping from trees after temperatures topped 47 degrees in parts of New South Wales. The area worst affected was Casino in the Richmond Valley region of northern New South Wales, where more than 2,000 dead flying foxes have been found. Richmond Valley Council general manager Vaughan Macdonald said many of the dead bats were difficult to access because they were scattered along riverbanks. He said the council was working as fast as it could to dispose of the animals, but residents should brace themselves for the stench of decay. "For the bats that remain in the trees they will start to decompose and as that happens they will drop," Mr Macdonald said. "We will continue to monitor the area and pick them up as that happens. "There may be some odours, so again people just report that to council and we will respond as soon as possible." WIRES Northern Rivers Bat Coordinator Lib Ruytenberg said despite the high losses, volunteer wildlife carers had managed to save a few hundred bats in the Casino and Kyogle areas. "We were using mist-spraying to hydrate the trees where the bats were roosting [in Casino] and the ones that came down low, we took them into care and hydrated them," she said. Ms Ruytenberg said the heat stress would continue to affect bats throughout the week. "Over the next few days we'll be seeing bats still coming down and falling into people's backyards," she said. "Members of the public need to remember that they shouldn't touch the bats. "They can throw a towel over the bat if it's on the ground, but then they need to call us [WIRES] to take it away." More than 700 flying foxes also died in the Upper Hunter town of Singleton due to the extreme heat. 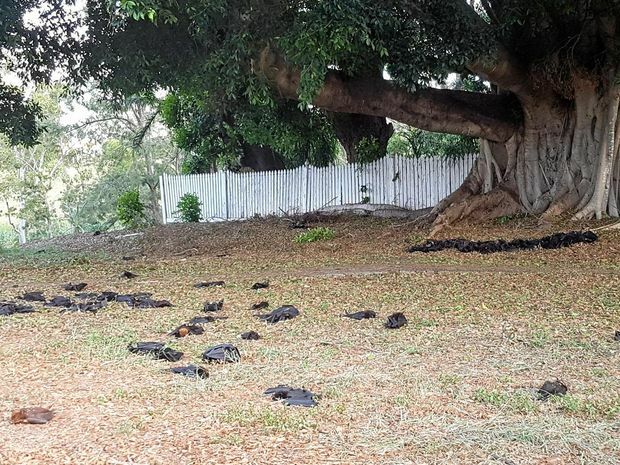 The majority of the dead bats were found in Burdekin Park, which has been home to a large flying fox population. Singleton experienced temperatures of 47 degrees over the weekend. Jalla Presland, from Wildlife Aid in the Upper Hunter, said it was the worst heat stress-related deaths they had seen in the colony in more than 10 years. "We are currently sitting at just under 700 and that's without having collected the ones from around the town," she said. "Unfortunately we encounter it in much smaller numbers most summers. "The worst one that we have encountered is this one since 2004." North Coast Area Health Service spokesman Greg Bell warned people not to touch bats unless they were fully vaccinated against lyssavirus and trained to handle bats. "Australian bats can carry the lyssavirus and that's very serious," he said. "We've had three human cases of lyssavirus in Australia, in Queensland, and all three people died." Mr Bell said if anyone was bitten or scratched by a bat they must seek medical treatment. Wash the site with good quality soap and water, apply a good quality disinfectant and then call your GP or present to the nearest emergency department," he said. "There is no risk from the odour, faeces or urine."